ORDER BONUS: Order now and receive resell rights so you can sell Word to Web and keep 100% of the profits! Stop creating your web pages the hard way! Quickly create stunning web pages in less than 5 minutes. No coding involved, Word to Web automatically creates your web pages for you. No HTML coding! Just click 'Generate Code' and Word to Web creates your sales page, thank you page and even automatically creates your ClickBank instant download link. Forget about difficult and tedious hand coding of your web pages . 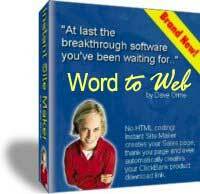 . . Word to Web does it for you and without HTML errors. Word to Web lets you create your own custom web pages instantly. No need to learn HTML or spend hours debugging code, just paste your sales copy straight from MS Word. With Word to Web you can instantly and easily add testimonials to your web page. Quickly and easily create the ClickBank order links so customers can immediately order products from your site. Quickly and easily create your ClickBank thank you page. Quickly create your product download link - so customers get their products automatically as soon as their order is processed. Quickly and easily create web pages that are fully optimised for high search engine ranking because Word to Web is designed to automatically include search engine friendly HTML code (meta tags) for your pages. When you order today, you’ll also receive the resell rights, along with the web page and graphics so you can sell Word to Web on your own site. Make just one sale, and you've paid for your investment! 90 Day GUARANTEE: If Word to Web is not everything that we say it is and you are not completely satisfied with it, then we will refund every penny of your money within 90 days of purchase with no questions asked. P.S. Don’t forget, you receive resell rights to Word to Web when you order! P.P.S This page was created with Word to Web!